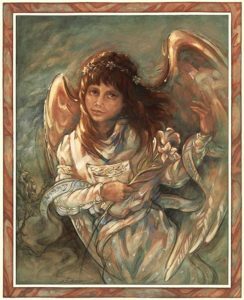 View cart “Dream Angel Fine Art Print” has been added to your cart. 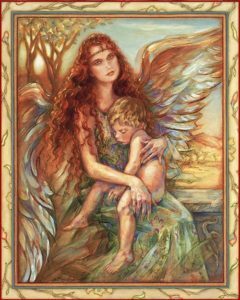 Portrays the guardian angel, the guardian of innocence. Someone to watch over us, to tenderly shield us from danger. Enfolded in her loving arms, we find comfort from pain, calm in a storm. My model here is the same gal I used in my painting "Down Time" in the Cowgirl Gallery. She really had gorgeous long red hair like this. She is seen here posing with her son. (Without wings, of course, I added those later). 14" x 17" fine art print of original acrylic/watercolor painting. Fade resistant inks on high quality acid-free archival paper. A portrait of the soul of an angel. An angel of grace to guide us between light and darkness. She is the angelic conscience to help us make choices between good and evil; between what is real and what is a dream. 14" x 17" fine art print of original acrylic/watercolor painting. Fade resistant inks on high quality acid-free archival paper. 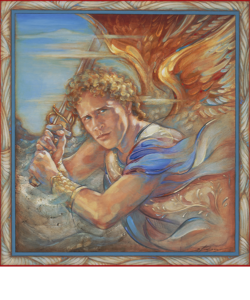 The celestial warrior, Michael; the prince of angels, defending us with his invincible strength and courage. Symbolizing the angel who stands by us, helps fight our battles, and protects us from harm. 14" x 15" fine art print of original acrylic painting. Fade resistant inks on high quality acid-free archival paper.